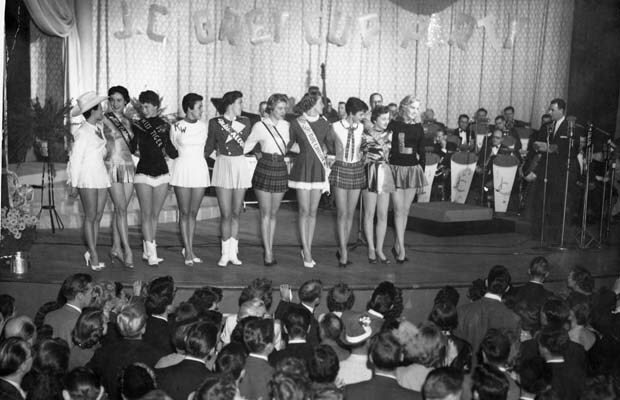 The contestants for the 1955 Miss Grey Cup pageant line up on stage in Vancouver. Glenda Sjoberg, the 18-year-old Miss B.C. Lions, is on the far right wearing a sweater with the letter L on the front. The crown went to Miss Edmonton Eskimos. The Grey Cup parade featured clowns and cowboys; marching bands and baton-twirling majorettes; Mounties in Red Serge, a smart Stetson on each head, and Shriners in silky harem pants, a silly fez on each head. 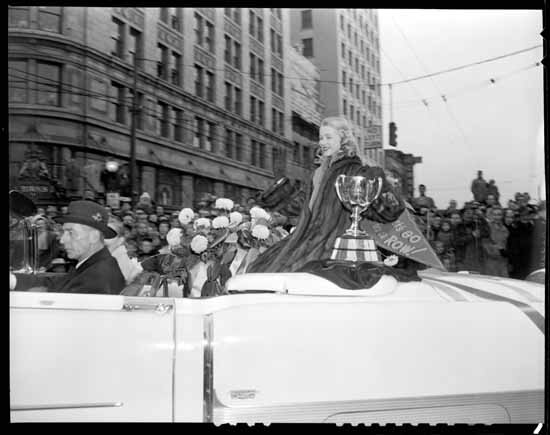 In 1955, on the cusp of the first Grey Cup football championship to be played on the West Coast, tens of thousands lined the neon-lit streets of downtown Vancouver for a glimpse of the spectacle. A procession of horses and tractors and colourful floats paraded past. There was a grizzled prosector with a mule and an inexplicable Saskatchewan display featuring a man in a football costume shoveling wheat over his shoulder onto the blacktop. An open convertible carried Marilyn Bell, who was cheered by the throngs a year after the teenaged swimmer conquered Lake Ontario. Towards the end, a young woman wearing a sweater in the black-and-orange livery of the local football team waved to the crowd while sitting atop the trunk of a convertible. This was Miss B.C. Lions, a beauty queen selected to represent the team in the contest to be named Miss Grey Cup. 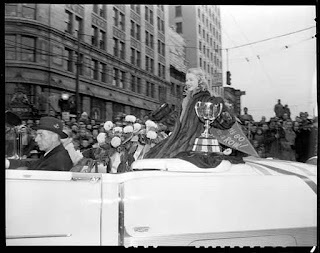 Miss Grey Cup escorts the trophy at 1955 parade. Glenda Sjoberg, known as Goldie for her lustrous locks, was an 18-year-old logger’s daughter from Nanaimo. 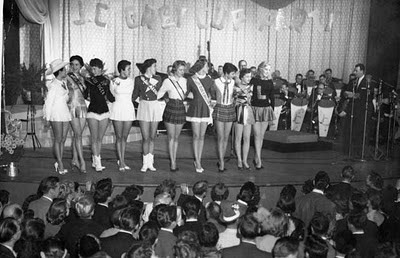 According to the newspapers, she was “Glamorous Glenda,” a “comely,” “charming,” “beautiful,” “tall, blue-eyed blonde.” She had won a local beauty pageant to become Miss Nanaimo before defeating 22 other contestants to become Miss PNE (Pacific National Exhibition). She won a gold compact, a white Arctic fox fur shoulder piece, and a carved hardwood salad bowl from the British West Indies. Officials presented her a cheque for $1,000, which she said would be used to pay for treatments for her mother, Olga, bedridden with arthritis. As Miss PNE, Miss Sjoberg automatically became Miss B.C. Lions, making necessary a crash course in football, a sport about which she knew little. In the end, she did not win the Miss Grey Cup title, which went to Miss Edmonton Eskimos. The Eskimos were also successful on the gridiron, defeating the Montreal Alouettes, 34-19, to claim the trophy. Empire Stadium was packed with 39,417 paying customers, a Grey Cup attendance record that would stand for 21 seasons. For a young woman from Vancouver Island, her reign as a local pageant queen was a whirlwind of adventure. (But not too much adventure. She was chaperoned by a family friend.) She did not entertain visions of trying to break into movies. After the game, she returned to the anonymity of life as a dental assistant on Vancouver Island. A few years later, she graduated from a course for stewardesses conducted by Trans-Canada Air Lines. They issued a press photograph to promote their hiring of a former Miss B.C. Lions. Miss Sjoberg had been on the job less than a year when she would need to call on all her training. 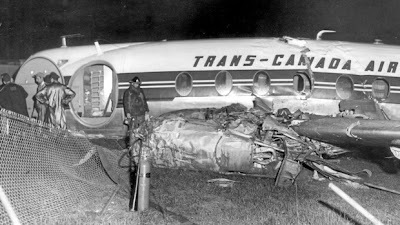 On Oct. 3, 1959, she was aboard a Viscount airliner on approach to Malton airport, outside Toronto, in a blinding rainstorm. The stewardess was handing out hats and jackets to the passengers when intuition led her to quickly take her place in a rear-facing jump seat. Just as she was about to buckle the seatbelt, the plane touched down hard before becoming airborne again. Short of the runway, speeding along at 120 m.p.h., the plane clipped a light pole, ripped off barbed wire atop a fence surrounding a covered reservoir, bounced into the air, narrowly missing a transformer, before skidding over a ditch and across a road and over another ditch, then tearing down a section of the fence surrounding the airport before coming to a thudding halt, the fuselage cracked in half. For a moment, there was also silence. A woman cried out. She had been holding twin baby girls in her arms and both had slipped from her grasp on a hard bounce. The infants were found beneath the seats, unharmed. Miss Sjoberg ensured the passengers and crew were evacuated before going for help. She made her way in stocking feet to a nearby service station, telling them to call for an ambulance. Then she returned to the plane to assist three fellow crew members and 36 passengers. Among them was Ward Cornell, the sports announcer who was about to make his debut on Hockey Night in Canada. Four went to hospital with injuries, including the pilot and the other stewardess. All survived. Some contemporary accounts hailed her as a hero. The crash was blamed on wind sheer. The turboprop was a write-off. The following year she married Pete Kinzie, a pilot. She had to quit her job, as married women were not allowed to work as stewardesses in those days. She enjoyed the work, and now remembers happily the pleasures of passenger flight in those days. She has yet to see an episode of the period drama Pan Am. She traveled the world with her husband before settling in Burlington, Ont., where today a 75-year-old retiree can barely believe she was once Miss B.C. Lions. This Trans-Canada Air Lines Viscount landed short of the runway at Toronto's Malton airport in 1959. It skidded along the ground along the length of several football fields. All 40 passengers and crew survived, including a stewardess who had been a beauty queen.